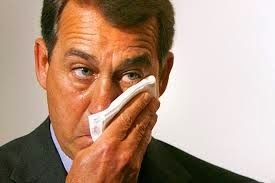 Bluegrass Pundit: Whatever happened to that #Obamacare lawsuit Boehner claimed he was filing against Obama? Whatever happened to that #Obamacare lawsuit Boehner claimed he was filing against Obama? Apparently, Boehner is too busy campaigning, golfing and going to the tanning bed to take the 10 minute trip down the hill to the Federal Courthouse. The GOP needs new leaders. If Boehner and McConnell had spines, there wouldn't be any need for a lawsuit. Congress would have never funded Obamacare in the first place. It takes about 10 minutes to walk from the Capitol to the federal courthouse just down the hill, but House Republicans haven’t managed to make that trip in the four months since they announced they’d be suing the president. There are times I think GOP concocted a lawsuit just to shut us up.